Lewis is a British television detective drama produced for ITV. It is a spin-off from Inspector Morse and, like that series, it is set in Oxford. Kevin Whately reprises his character Robert "Robbie" Lewis, who was Morse's sergeant in the original series. Lewis has now been promoted to detective inspector and is assisted by DS James Hathaway, portrayed by Laurence Fox, who was promoted to inspector before the seventh series. The series also stars Clare Holman as forensic pathologist Dr. Laura Hobson, likewise reprising her role from Inspector Morse and from the seventh season, Angela Griffin as DS Lizzie Maddox. On 2 November 2015, ITV announced that the show would end after its ninth series, following the decision made by Kevin Whately and Laurence Fox to retire from their roles in the series. Whately announced that the show had gone on long enough, with his character having done many stories between Morse and Lewis after he took on the role 30 years ago. Kevin Whately as Detective Inspector Robert Lewis (2006–2015): Widowed after his wife was killed in a hit-and-run car collision, Inspector Lewis is a workaholic. He often shows an uncanny intuition in solving murder cases. He is the father of two children, including daughter Lynn who is married and has a baby at one point in the series. Laurence Fox as Detective Sergeant (later Detective Inspector) James Hathaway (2006–2015): James Hathaway is a very private person, often hiding his feelings or past from Lewis, even when it is relevant to a murder investigation, although early in the first season he mentioned that he studied to be a priest before deciding to become a police officer. Clare Holman as Dr. Laura Hobson (2006–2015): Romantic tensions simmer between forensic pathologist Dr. Hobson and Lewis throughout the series. Hobson is single and childless, and like Lewis and Hathaway, is dedicated to her job to a point that it interrupts many of her personal plans. She and Lewis become a couple during the sixth season. Rebecca Front as Chief Superintendent Jean Innocent (2006–2014): She is the senior officer supervising Lewis and Hathaway. When Lewis returned from his overseas secondment, Innocent was not convinced that he would be of value, but he proved himself to her on his first case. Innocent is frequently at odds with Lewis over his investigation style. In Series 9, it is revealed that she has gone to work for Suffolk Constabulary. Angela Griffin as Detective Sergeant Elizabeth "Lizzie" Maddox (2014–2015): She becomes Hathaway's DS, following his promotion to detective inspector. Steve Toussaint as Chief Superintendent Joseph Moody (2015): He arrives at Oxfordshire Police as the new chief superintendent, replacing Innocent. He soon clashes with Lewis over the latter's more traditional approach to detective work. Colin Dexter, the author of the Inspector Morse novels, makes a very brief cameo appearance in several episodes, including one as a porter at Wadham College. The episode scripts follow Dexter's approach, but each of them is credited to one of several other writers including, most frequently, Russell Lewis, Alan Plater, and Stephen Churchett. The music for the series was composed by Barrington Pheloung, who created the music for the original Inspector Morse series. Following the broadcast of a pilot in 2006, the show's first series was commissioned by ITV, consisting of three episodes that were broadcast between February and March 2007. Following this, further series were commissioned, each with four episodes—the second series was broadcast in 2008 from 24 February to 16 March, the third series in 2009 from 22 March to 12 April, the fourth series was aired in 2010 throughout May, the fifth series was aired throughout April during 2011, and the sixth series was broadcast in 2012 from 16 May to 6 June. During May of that same year, after the show was renewed for a seventh series, Fox made a statement it would be the show's last, as both he and Whately wished to move on to other things. The seventh series was broadcast during 2013 from 7 January to 11 February, and consisted of three two-part stories. On 10 February 2014, an official announcement was made that the show was to return, with all four original main cast members coming back to do another series. The eighth series consisted of three two-part episodes, with shooting beginning in March 2014. It was broadcast that same year, from 10 October to 14 November. Later that year, on 21 November, Whately announced on BBC Radio Oxford that a ninth series would be made, with shooting occurring on 2015 between May and June. This was also confirmed by Griffin on BBC Radio 2, and then by Fox in March 2015 during an interview with the Evening Standard. On 8 April 2015, ITV officially commissioned a ninth series of Lewis. On 30 September 2014, Whately revealed in an interview with the Radio Times, that the ninth series would be his last, having felt that he had played the character long enough for the past 30 years. His decision to leave, along with Fox's, was officially announced by ITV on 2 November 2015, with the network revealing the ninth series of Lewis would be its last. The majority of the series is filmed in and around Oxford. Some scenes are also filmed at Brunel University and parts of Ealing. 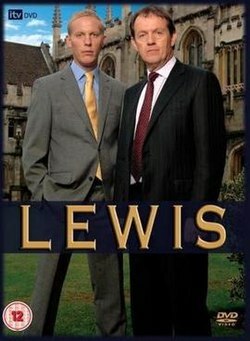 PBS broadcast the series as Inspector Lewis in the United States and Canada, as part of its Masterpiece Mystery series. In the United States, all episodes of Lewis were originally shown as Inspector Lewis on Masterpiece Mystery! on PBS, except for the pilot, which was shown on the earlier series Mystery! in 2006. The numbering of the episodes on PBS is slightly different from those on ITV. Series 1 was broadcast as Season 1 in 2008. However, all of series 2 and episodes 1–3 of series 3 were broadcast as Season 2 in 2009. Episode 4 of series 3 and all of series 4 were broadcast as Season 3 in 2010. Series 5,6,7 and 8 were shown as Seasons 4,5,6 and 7 in 2011-2014. Series 9 was broadcast as "Season 8" in August 2016. ^ 8.46 million on ITV1, and 240,000 on the ITV1 HD simulcast. ^ 8.03 million on ITV, and 198,000 on the ITV1 HD simulcast. ^ 7.17 million on ITV, and 119,000 on the ITV1 HD simulcast. ^ 6.90 million on ITV, and 207,000 on the ITV1 HD simulcast. ^ "Lewis to End after Ninth Series". BBC News. Retrieved 3 November 2015. ^ Woods, Judith; "Laurence Fox: 'I’m a manic, indiscreet mess", The Daily Telegraph, 18 June 2011. Retrieved 17 July 2012. ^ "Foody Friday: the best local food, plus actor Kevin Whately, Kat Orman". BBC Radio Oxford. ^ "Angela Griffin talks to Steve Wright, Barry Manilow, Angela Griffin and Amanda Hamilton, Steve Wright in the Afternoon". BBC Radio 2. ^ "Laurence Fox: Lewis will return once I've cracked my first album". 20 March 2015. ^ "ITV commissions ninth series of Lewis". ^ "Kevin Whately—'I think Lewis has gone on long enough'". ^ "Final Lewis episode brings one of ITV's best-loved and most enduring dramas to a close". ^ "Inspector Lewis". Public Broadcasting Service. Retrieved 19 October 2009. ^ "Weekly Top 30 Programmes". Broadcasters' Audience Research Board. Retrieved 4 August 2010. ^ "Weekly Top 30 Programmes: ITV1 w/e 2 May 2010". Broadcasters' Audience Research Board. Retrieved 5 August 2010. ^ "Weekly Top 10 Programmes: ITV1 HD w/e 2 May 2010". Broadcasters' Audience Research Board. Archived from the original on 13 January 2013. Retrieved 5 August 2010. ^ "Weekly Top 30 Programmes: ITV w/e 9 May 2010". Broadcasters' Audience Research Board. Retrieved 5 August 2010. ^ "Weekly Top 10 Programmes: ITV1 HD w/e 9 May 2010". Broadcasters' Audience Research Board. Archived from the original on 13 January 2013. Retrieved 5 August 2010. ^ "Weekly Top 30 Programmes: ITV w/e 16 May 2010". Broadcasters' Audience Research Board. Retrieved 5 August 2010. ^ "Weekly Top 10 Programmes: ITV1 HD w/e 16 May 2010". Broadcasters' Audience Research Board. Archived from the original on 13 January 2013. Retrieved 5 August 2010. ^ "Weekly Top 30 Programmes: ITV w/e 30 May 2010". Broadcasters' Audience Research Board. Retrieved 5 August 2010. ^ "Weekly Top 10 Programmes: ITV1 HD w/e 30 May 2010". Broadcasters' Audience Research Board. Archived from the original on 13 January 2013. Retrieved 5 August 2010. ^ "Weekly Top 10 Programmes: ITV HD w/e 3 April 2011". Broadcasters' Audience Research Board. Archived from the original on 13 January 2013. Retrieved 29 May 2012. ^ "Weekly Top 10 Programmes: ITV HD w/e 20 May 2012". Broadcasters' Audience Research Board. Archived from the original on 13 January 2013. Retrieved 29 May 2012. ^ Episodes 1, 2, 4 and 6 are based on 28 day data from BARB for ITV and ITV+1 and 7 day data for ITV HD. Episodes 3 and 5 are based on 28 day data from BARB for ITV and ITV+1.